After the intensely dramatic way things ended for Becca Kufrin on The Bachelor when Arie Luyendyk Jr. proposed and then dumped her, you'd hope that her time as The Bachelorette would begin as smoothly as possible. Unfortunately, that's not the case in tonight's premiere. Just on night one, before she's gotten to know anyone, Becca has to deal with a stupid amount of drama mostly having to do with guys who are most likely not there for—say it with us now—the right reasons. "I was not expecting drama on night one, which we got a taste of," Becca teases. "I mean, that's scattered throughout the season. There were a lot of laughs, a lot of tears, some fights between the guys, and so that will all play out." As for the Arie of it all, Becca is feeling pretty good about watching the season back and dealing once more with her heartbreak. "I came onto this journey knowing that I was going to have to talk about my time last year and my relationship with Arie, and I knew that the guys would have questions about it, so it's something that we talked about throughout the entire journey, because it's part of my story, and it's led to why I am where I'm sitting," she says. "It's just who I am and it's in the past now, but right now I'm just so focused on the present and watching it all play back and my relationship at this point." And if you've been watching the promos or seen any promotional material for the show, you'll know that they're really leaning into what has become Becca's tagline. When she got out of the limo on The Bachelor last season, she proposed to Arie by asking if he was ready to "do the damn thing," which now seems to have stuck. But if Becca has anything to say about it, it won't be her tagline much longer. "Honestly I think I need to retire that tagline," she says. "It came out of my mouth last year and I wasn't even expecting to say that, it just kind of popped out and I was like, did I really just say that? I'm ready to put it to bed though. I need a new tagline I guess." For more from Becca, hit play above! 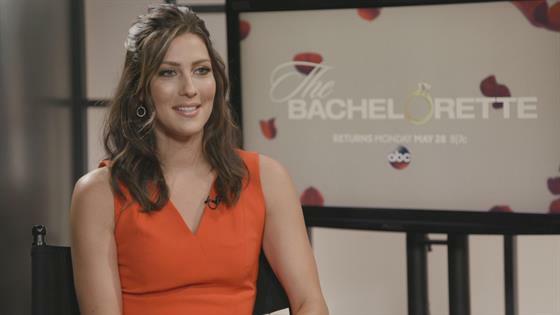 The Bachelorette premieres tonight at 8 p.m. on ABC.